Starting at 3.00pm we rang a 10 bell Quarter Peal of 1260 Plain Bob Royal. It took 54 minutes to complete. This was the first Quarter of Royal (all 10 bells changing) on the bells. More information. The Peal Appeal work was carried out by the Whitechapel Bell Foundry of London. Their website news page has an article about the augmentation work. Use this link to the News Web Page. Starting at 3.00pm and specially for the Christingle Service the first quarter peal was rung on the augmented and re-tuned 10 bells. 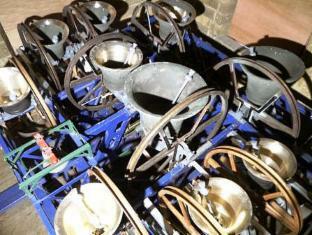 The method was Plain Bob Caters, (9 bells changing and Tenor covering). 1296 changes were rung and it lasted for 53 minutes. It was exactly 3 months ago on 18th September that the last quarter peal was rung on the original 8. More information about the first quarter on the 10 and the last quarter on the 8. Members of our team joined ringers from the Sheffield and Rotherham area for an evening's ringing on the 6 bells of St Mary's, Beighton. We also enjoyed some refreshments and food afterwards making this a very enjoyable event. The Sheffield Branch of the YACR hold a meeting at a different tower once per month. All the work is completed, the 10 bells were rung for the first time on Thursday 1st December by an all Ecclesfield team of ringers. The ring is transformed, Whitechapel Bell Foundry have done a superb job of tuning the bells to Simpson standard and fitting them in to our tower. Ecclesfield ringers were joined by ringers from many South Yorkshire towers, Neil from Whitechapel foundry, officers from the PCC, friends and relations and those who had helped us remove and re-hang the bells. The photo shows all 10. The 2 new trebles to the bottom right. Rounds, Plain Bob Royal, Grandsire Caters were rung on the 10. Plain Bob Minor was rung on the front 6. The clappers were delivered today and we made a start fitting them and adjusting the striking so that the bells are evenly struck. The tower floor trapdoors have been sealed shut, the protective barrier round the hole in the floor removed, rope guide bosses fitted to the ceiling and we have started fitting ropes to the bells. 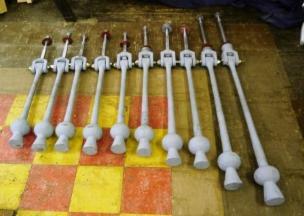 The photo shows the clappers laid out on the ringing room floor. During November we have continued to run a Tuesday night practice. Other towers in the area have kindly allowed us to use their bells. So far this month we have been to Hoylandswaine and Penistone. 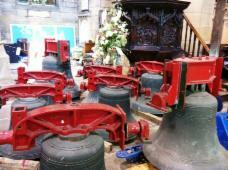 New wheels on the 2 new bells, refurbished wheels on the recast bells and the other 6 originals put back in place. The stays and sliders fitted. The contractors working on the exterior have completed the new louvre windows and the weatherproofing. The plan is coming together, just the clappers to fit next week and the rope holes to make in the ceiling of the ringing room. By the end of the day we had all of the 10 bells installed in belfry. Working round the frame, one by one each bell was hoisted back to its pit. Gently lowered, bearings fitted and bolted into place. The photos show the new 2nd on its way up, the letters on the inside say 'Ecclesfield No2 F# and the last bell (the 15cwt Tenor) on its way back to its home in the centre of the frame. Still some work to do before we can try them out but the heavy lifting part is finished. 8.30 today the Whitechapel Bell Foundry lorry pulled up outside St Mary's with our bells onboard. We soon had them off the lorry and lines up outside the Church for photographs to be taken. Luckily the sun came out just in time and we had an appreciative group of admirers and photographers all wanting a picture. By mid afternoon we had them safely in the building. We even had time before the end of the day to haul 2 of them back up the tower to their home in the bell frame. By the end of the week we had both the new frames installed. 2 new bell pits at the south side and 2 new bell pits at the north side of the frame. The new south frame is for the 2 new trebles, the 3rd and 4th (recast original 1 and 2) go in the old 2 and 3 pits and the new frame on the north side is for 5 and 6 (original 3 and 4), the remaining bells (5,6,7,8) go in their original places but are now numbered 7,8,9 and 10. Work started today installing the new metal frame sections for the 2 new bells. The Whitechapel Bell Foundry lorry delivered them at 10.30am and we hauled all the new frame sections from the lorry to the top of the tower. Down the path, up the ramp in to the church, across the isles and under the tower. Then an electric winch hauled each section up through the floor trapdoors to the top of the tower. Here they are pulled and pushed in to the right place. Heavy work but very enjoyable. 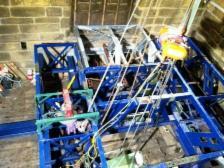 The photo shows a sight that has not been seen for 60 years, the tower floor trapdoor open and sections of new bellframe being winched up the tower. As our bells are out of action we thought it would be a good idea to go to help another tower to ring their bells half muffled for Remembrance Sunday. We chose our nearest neighbouring 8 bell tower 4 miles away, St Leonards at Wortley. We rang the bells jointly with Wortley's ringers and we were particularly pleased to have rung St Leonards Doubles at St Leonards. The 8 bells at Wortley were cast by John Warner and Sons of London. Mary Caroline Stuart-Wortley Marchioness of Drogheda who was the sister of the first Earl of Wharncliffe gave the bells as a gift to the church in memory of her husband. They were hung in the tower in 1893. 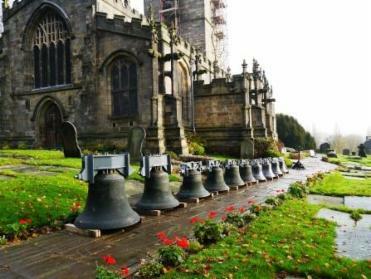 21/10/11 - Recasting of the original 1st and 2nd bells. Earlier this year our 2 new bells were cast at the Whitechapel Bell Foundry, photos are on the St Mary's Ecclesfield Website. On 21st October the foundry recast the original Treble and Second bells which now recast will be the third and fourth of the new ring of 10. The recasting was paid for by the Sheffield Branch of the Yorkshire Association of Change Ringers. Our bells are away being retuned and refurbished but we have been keeping going with our Tuesday night practices. Other towers in the area have kindly allowed us to use their bells on Tuesdays and some of our team have had the opportunity to do some ringing in towers they have not been to before. During October we have been to Bolsterstone, South Anston, Wortley and Whiston. Ecclesfield ringers and their families joined other ringers from the Sheffield and Rotherham towers for a day ringing in Lincolnshire. We started the day at Deeping St James then moved on to Crowland Abbey. A pub lunch was enjoyed by all of us then we were off to Baston and Bourne where we refreshed on tea and coffee before finishing the day at Edenham. 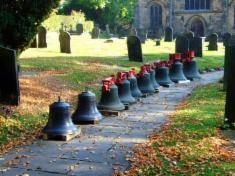 The bells were wheeled out from the Church and were lined up for photographs in the churchyard. All 10 (8 original and 2 New). Next they were loaded on to the lorry and headed off for Whitechapel Bell Foundry, London. We will not see them again until around Christmas or early New Year. Its been a busy few days, Whitechapel Foundry assisted by some of our ringers have lowered the bells through the trap doors down in to the Church. The fixtures and fittings have been removed and they are ready for transport to London. The last time anyone witnessed this in Ecclesfield church was 1952. 18/09/11 - The Last Quarter Peal and the Last Ringing on the Eight Bells. 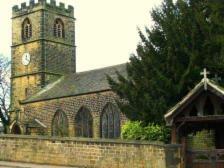 In 1845 Ecclesfield's ring of eight bells rang forth for the first time. On 18th September 2011 they rang for the last time prior to the Evening Service. A Quarter Peal of 1260 Plain Bob Triples. 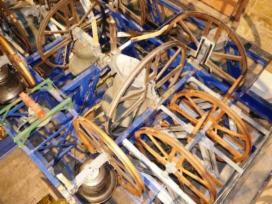 The bells are to be removed and taken to Whitechapel Bell Foundry to be retuned and 2 will be recast. When they return around Christmas they will be a ring of 10. The photo is the ringers who rang the last Quarter Peal and the last ringing on the eight bells prior to recasting of 1 and 2, retuning of 3,4,5,6,8 and augmentation to 10. 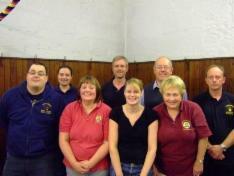 From left to right the ringers are: Jason, Katie, June, Philip, Helen, Stuart, Jennifer and Andrew. Members of the team had a stall at the local gala in Ecclesfield Park. The morning proved to be very wet with drizzle and rain however the sun came out in the afternoon and we had a very enjoyable day. During the Sunday Morning Service the two new bells were blessed by Revd. Jeni Fryer. After the 11.15 service we rang a Special Quarter Peal to celebrate the To Celebrate the Baptism of Harry Michael Palmer and Mia Evie Garrett. 1260 changes of Plain Bob Triples rung in 47 minutes. More information about this Quarter Peal. Members of the Yorkshire Association of Change Ringers successfully completed a Peal of 5056 changes of Cambridge Surprise Major in 3 hours and 5 minutes. Rung from 5.45pm to 8.50pm the Peal is the first this year at Ecclesfield. More information about the Peal. 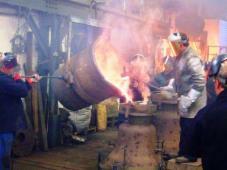 At 2.45pm at the Whitechapel Bell Foundry, London, the 2 new bells for our augmentation to 10 were cast. This marks a major landmark for The Ecclesfield Peal Appeal. Molten bell metal from the foundry furnace was carefully poured in to the 2 moulds that had been prepared over many days. The bells will take 3 to 4 days to cool down then the moulds will be opened to reveal the new Treble and Second bell of the Ecclesfield ring of 10. Photos are on the St Mary's website. 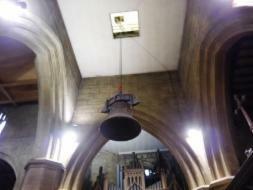 The work to remove our existing bells starts in late September. Please see our Ecclesfield Peal Appeal page for more details. We entered a team in the branch striking competition held this year at St Helen's, Treeton. Walkley were the winners and Ecclesfield were placed second. Over the course of today, visitors came to ring at the towers in our area that were open as part of our ringing day. Starting at Darton in the morning and finishing at Rotherham Minster in the early evening with 15 other towers in between and the added bonus of fine sunny weather local ringers and visitors enjoyed the day. We would like to thank the incumbents and ringers who made their church bells and facilities available for the event. St Mary's Ecclesfield in common with hundreds of other churches rang its bells today to celebrate the marriage of HRH Prince William and Miss Catherine Middleton, which took place at Westminster Abbey. A Quarter Peal of 1320 Plain Bob Minor was rung (click here for details) and general ringing. Prior to the Evening Service we rang a Quarter Peal of 1264 Plain Bob Major in 47 minutes. More information about the quarter. Sheffield Folk Chorale performed in St Mary's to over 100 people on Saturday evening. The concert raised more funds for our Peal Appeal and we would like to thank the Chorale for a superb evening, our ringers for providing refreshments and to all of you who came see the concert. 7 members of our team along with ringers from other towers in the Sheffield Branch of the YACR enjoyed an evenings ringing on the 8 bells of St James, South Anston. The photo shows St James in the spring sunshine while we were there. The Ringing World the weekly journal for Church Bell Ringers contained the annual quarter peal analysis with results for 2010. The country, county and leading towers information is published each year. 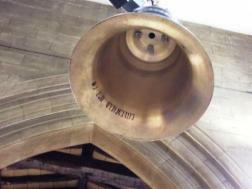 We are very proud that Ecclesfield in 2010 was the leading South Yorkshire tower for the number of Quarter Peals rung. There were 19. In 2009 Ecclesfield shared first place with Sheffield Cathedral as the towers in South Yorkshire that have rung most Quarter Peals. Members of our team met up with other ringers from the Sheffield Branch of the Yorkshire Association of Change Ringers in the afternoon to ring on the 6 bells at St Leonard's Thrybergh, then a Ringers Service followed by a very nice ringers tea. 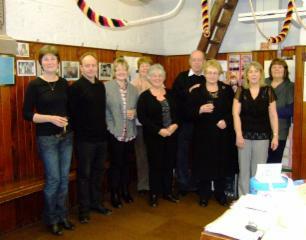 The Branch AGM followed with evening ringing on the 12 bells at The Minster Church of All Saints, Rotherham. This evening we rang a Special Quarter Peal to celebrate the 90th birthday of Phyllis Gledhill. 1284 changes of Plain Bob Minor on the back six bells were rung in 51 minutes starting at 7.30pm. More information about this Quarter Peal. On 5th February Ecclesfield hosted the general meeting of the YACR. Visitors came from all the branches of the association and beyond to ring in South Yorkshire and hold their meeting at Ecclesfield. Ringers started the day at Darton then moved on to ring here at Ecclesfield. A service in St Mary's followed the ringing then lunch and the meeting in the Gatty Hall. 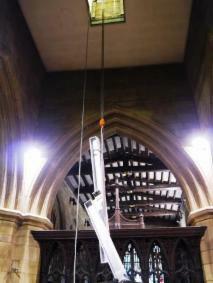 Ringing afterwards was at Whiston and Rotherham Minster. 7 of our team joined other ringers from the Sheffield Branch of the YACR for an afternoon and evening of ringing. We met at the Cathedral Church of St Marie on Norfolk Row and enjoyed a couple of hours ringing on the 8 bells here. Afterwards the branch meeting was held and Sheffield Cathedral and Walkley Ringers provided a lovely cooked tea. The evening was finished off with ringing on Sheffield Cathedral's 12 bells which were enjoyed by us all. For the third year in succession we rang the bells at Midnight to say goodbye to the old year and to welcome in the new.